Math students and teachers celebrated Pi Day with a variety of activities on Wednesday. Pi (π), which is the ratio of a circle’s circumference to its diameter, is observed on March 14 each year as the number begins with the digits 3.14. At Columbia, each student was assigned a digit of pi and given a circle or a square to decorate with his/her assigned digit. 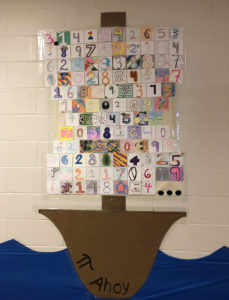 The designs were then added to pirate ship and treasure chest displays in the hallways to go along with the Math Department’s PI-rate theme. Columbia students participated in a Pi Day Can Drive and will donate the collected items to a local food pantry. Table Talk Pies donated snack pies that were distributed to the faculty and staff of Columbia High School, math teachers at Goff Middle School, and to administration and staff at the district office. The culmination of the day’s activities at Columbia was a Pi Day Recitation Contest with prizes. Goff math teachers did PI-related activities with their classes. Students made treats to celebrate with teachers and classmates. Your digits so numerous – A length that mystifies. Whenever I see you, my heart starts to flutter. Your numbers so great, my brain melts like butter. My affection for you shall never wane. You stole my heart and fed my brain. Oh why, why Pi – Must you be so mysterious. Truly, your symbol leaves me delirious. I don’t know why I can’t eat Pi. Perhaps those numbers are just too sweet. You are a math teacher’s inedible treat. 3.14159 are all I know. For you, my Pi, I am truly smitten.